Observers of Korea's ICT-driven economy have long noted a fundamental problem: the nation's over reliance on the manufacture and export of hardware, rather than software and services. 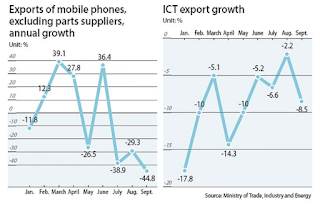 For a year now, growth in Korea's ICT exports has been falling, and as reported today by The Korea Joongang Daily, the problems with Samsung's Galaxy Note 7 phone have only exacerbated the problem. 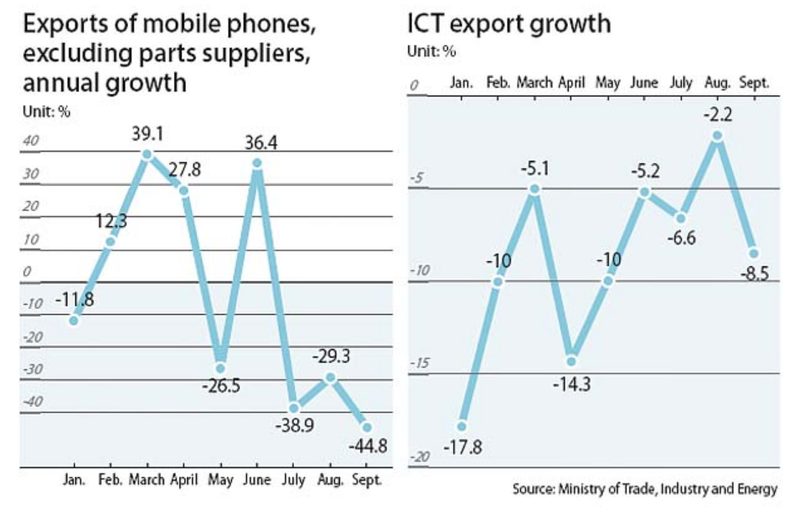 As reported in the article,"Exports of information and communications technology (ICT) fell for the 12th consecutive month as cellphones and televisions remained weak in foreign markets. ICT exports declined 8.5 percent year-on-year in September to $14.5 billion, the Ministry of Trade, Industry and Energy said Thursday. After posting a year-on-year decline of 1.6 percent last October, exports have continued a downward slide. Exports of cellphones fell 33.9 percent year-on-year to $1.87 billion, and those of semiconductor products fell 2.6 percent. The ministry cited mid-priced smartphones produced by Chinese manufacturers, as well as the failure of the Galaxy Note7, as the biggest factors in the collapse of cellphone exports."